Many photography blogs and books I’ve read urge photographers to pick their top 10 images every year, to take an accounting of where they are in their craft. Since this is the first time I’ve done such an accounting, I guess the first statement I’m making is that 2013 is the year I became a Photographer. I mean that in several ways. Although I’ve taken photos on a sometimes professional level, it all was out of necessity (I was publishing a website), it was a subject matter I knew well (basketball) and therefore could “fake” my way through, and I trained myself, many times by attending high-level workshops or seminars and therefore didn’t know a lot of basics of exposure and, often, composition. (NOTE: Clicking on images will reveal a full-sized version in a separate browser window). This past year, I became competent — meaning I could compose and expose an image and the picture would come emerge as I “saw” it in my mind’s eye. I settled upon a subject — or rather, it attached itself to me — and I suppose I have an emerging style. My subject of choice — outdoors — still is rather broad and remains in the evolving stage of definition. This also is the year I fell back in love with National Parks and learned to wait (for light, or something meaningful to happen, usually with wildlife), to use support (whether a tripod or bracing my arms), to wipe my lens when photographing in the rain or by other kinds of moving water (er, the ocean) and many other revelations that, on the surface, seem miniscule but, in the end, add up to something big. Yes, it’s something I used to preach to my girl’s basketball teams when I was coaching: It’s the little things that make the big things possible. The following list may not come out the same if someone more objective were editing my images of 2013. It’s difficult to leave sentiment out of the equation. 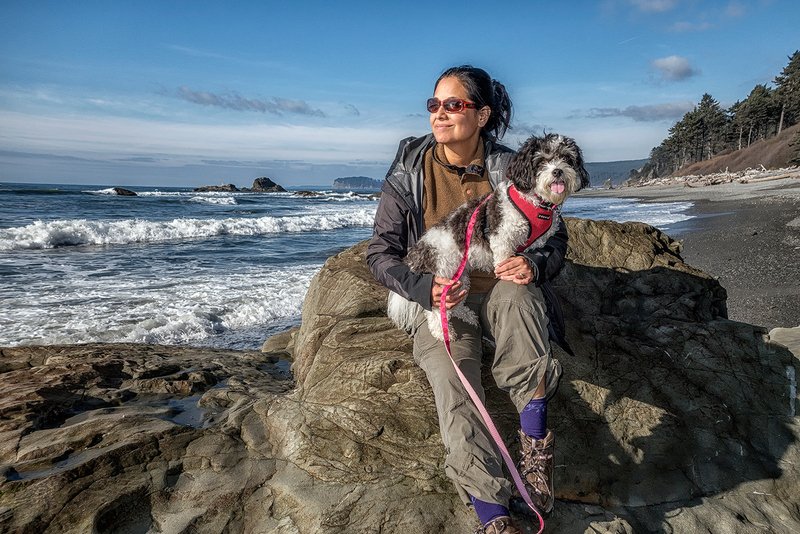 One of my favorite photos I took was of my wife, Florangela, and our baby, Santana (Banana), at Ruby Beach. But it didn’t make my top 10. Neither did the two photos that won categories in the Japantown:Exposed contest. However, the one that won an assignment and later was purchased by Outdoor Photographer Magazine to be published full page in its December issue did make the cut. I took some decent photos of friends who are musicians; none of those made it. And neither did a lot of “pretty” images from very sentimental times, such as my anniversary trip to Tofino or my first visit to Rocky Mountain National Park. But I did have to debate and leave some meaningful images out. That says something to me. And my goal is for the top photo of 2013 to not to even make the cut (in terms of quality) in 2014. 1. SECOND BEACH SUNRISE. Equipment: Nikon D800, Nikkor 14-24mm f2.8, Really Right Stuff TVC-33 Tripod, Really Right Stuff BH-55 Ballhead, F-Stop Guru Camera Bag. Exposure: 3-exposure bracket at f18 and ISO 100. This photo “breaks” a lot of rules, some would be mine. First off, it’s and HDR image, and I’ve really started not to like HDR because it’s been difficult (for me) to avoid them coming out looking phony. Also, there really is nothing special about this image, compositionally. But it has impact. 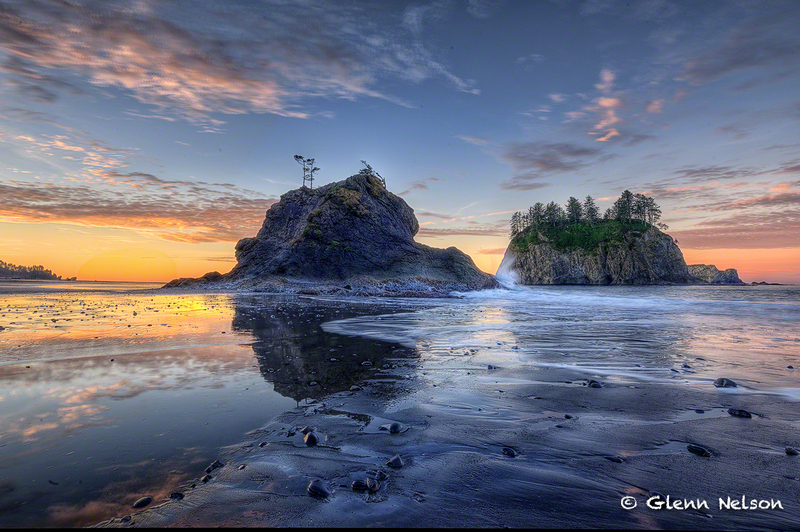 It reminds me of the awe I felt when I first stepped onto Second Beach. It also is the photo my father chose for his 80th birthday present from my mother, who had it blown up. Maybe that’s sentiment, but emotion counts in photography. That’s another thing I’ve learned along the way. 2. 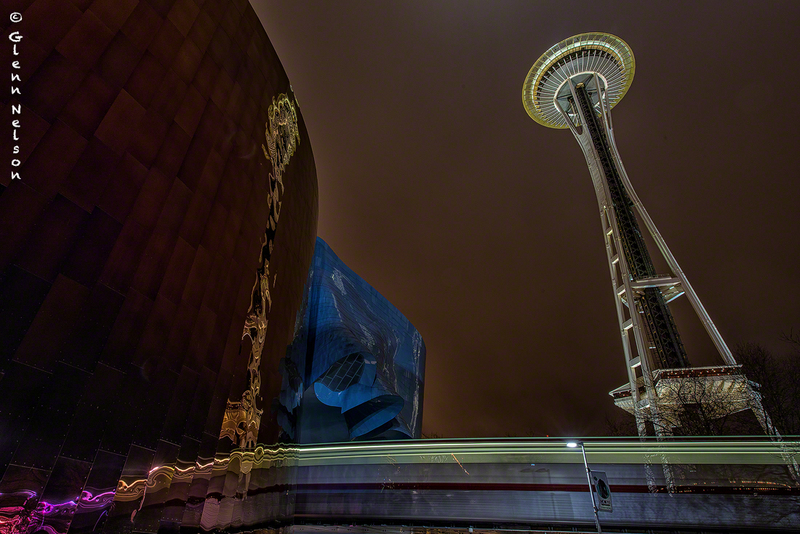 REFLECTIONS OF THE NEEDLE. Equipment: Equipment: Nikon D800, Nikkor 14-24mm f2.8, Really Right Stuff TVC-33 Tripod, Really Right Stuff BH-55 Ballhead, F-Stop Guru Camera Bag. Exposure: 6 seconds at f15 and ISO 100. There are “rules” broken in this image — mainly, that I didn’t fully correct for distortion. I chose to allow the Space Needle to lean because the reflections and the moving Monorail already lent an abstract nature to an image set at a very abstract facility in the Experience Music Project (EMP). Again, the biggest merit of the image, for me, is impact. It also is an example of an image I “saw,” then went back and executed. I saw this when Florangela and I were leaving one of the last concerts during the Earshot Jazz Festival at the Experience Music Project. I went back, over a month later, while looking for holiday scenes and remembered this. The long exposure reveals nice little details. 3. HANGING. Equipment: Nikon D800, Nikkor 70-200mm f2.8, Nikkor AF-S Teleconverter TC-14E II, Really Right Stuff TVC-33 Tripod, Really Right Stuff BH-55 Ballhead. Exposure: 1/800 seconds at f5.6 and ISO 1600. Some symbolism resides within this image, beyond the surface. I started my journey into outdoor photography with birds, which began my journey to understanding photography. It wasn’t until I had knee surgery, and had to lay off photographing birds (because of the heavy equipment), that I actually captured a capable image of a bird. 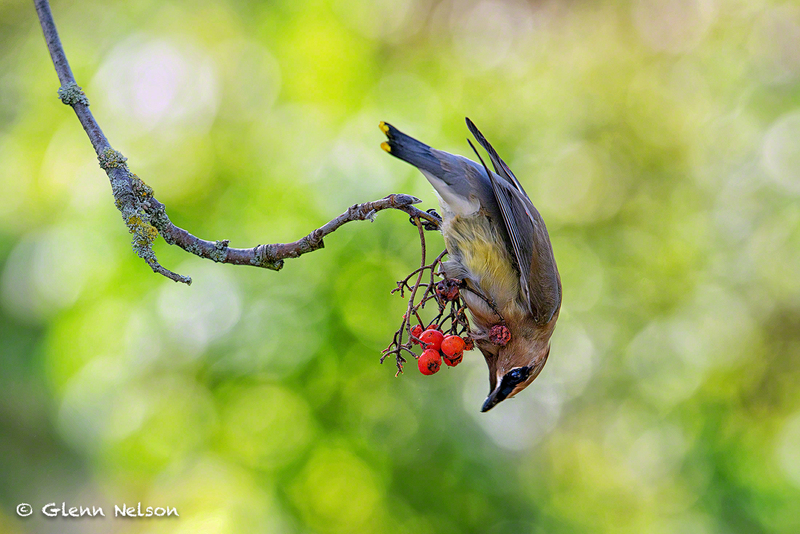 Plus, after all the hiking and traveling I committed to bird images, I captured this one in my backyard, in a mountain ash that attracts parrots in the spring and Cedar Waxwings like this one in late summer. I like the way the upside down bird completes an S shape with the branch. That, combined with the color, detail in the bird, and the fantastic bokeh, is what makes the picture for me. I also took some risk with this photo, using a teleconverter (and maybe losing sharpness) and extra ISO (to combat the shadows of the tree). 4. HEAVENLY FARMSCAPE. Equipment: Nikon D800, Nikkor 70-200mm f2.8, Really Right Stuff TVC-33 Tripod, Really Right Stuff BH-55 Ballhead. Exposure: 1/100 at f5.6 and ISO 150. I was up in beautiful Skagit Valley, about 90 minutes north of Seattle, to hopefully photograph some raptors, returning for fall and winter. It was a little early, and hunting season was in full force, so the raptors were scarce. 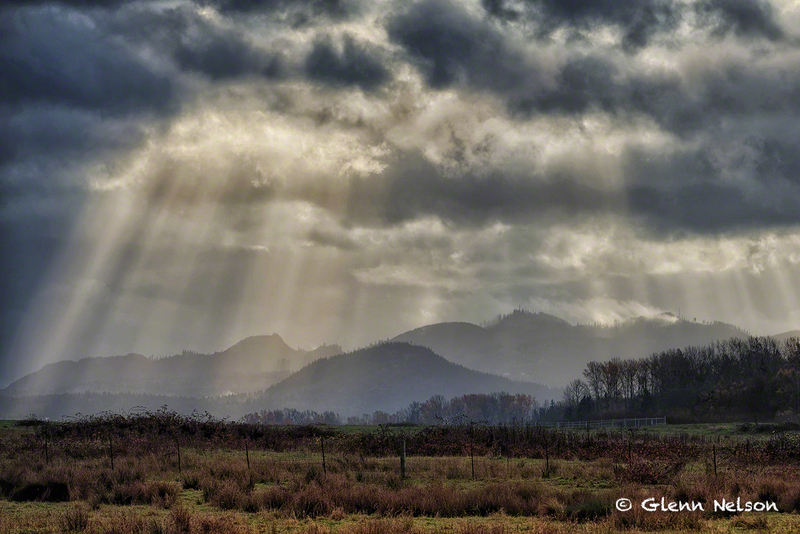 I was driving over to the water, to comb for shorebirds, when I noticed what seemed to be a battle between the sun and the clouds, taking place over farmland. I don’t really have anything profound to write about the exposure; I went to emphasize the rays breaking through the clouds. I know I keep repeating this word, but “impact” is what comes to mind when I view this picture. 5. BEAR LAKE AFTER SUNSET. Equipment: Nikon D800, Nikkor 18-35mm f3.5-4.5, Really Right Stuff TVC-33 Tripod, Really Right Stuff BH-55 Ballhead, Nikon MC-36 Multi-Function Remote Cord, Lee Filters holder, Lee Filters Big Stopper (10-stop) ND filter, F-Stop Guru Camera Bag. Exposure: 2 minutes, 56 seconds at f9 and ISO 100. I’m not sure if my loading the top of my list with more recent work reflects my improvement as a photographer or the fact that one gets tired of an image after a while. 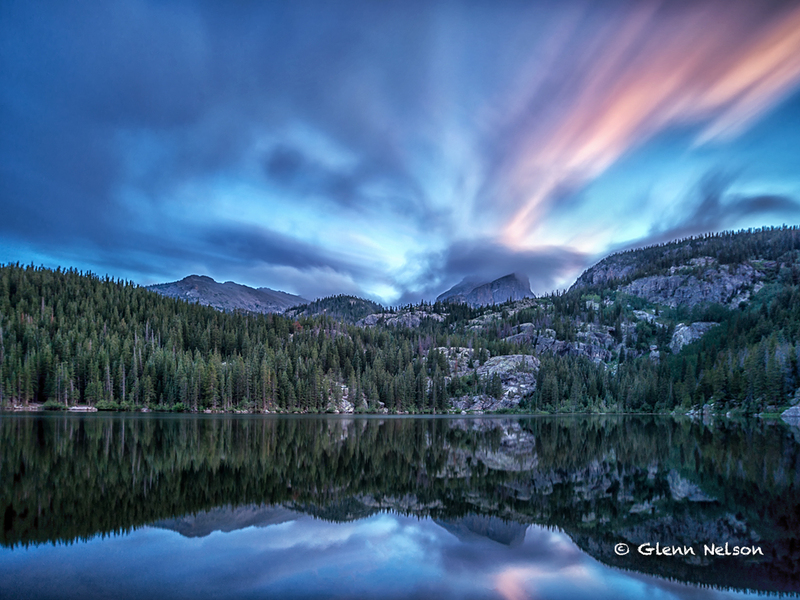 I almost dropped this even lower, but it did get published in Outdoor Photographer, after all, and upon further review, I love the detail, especially in the reflection on very calm water. The streak of pink gives the image an umph; it was the product of using a 10-stop filter, after sunset, ostensibly to capture movement of the clouds, but ultimately detecting the day’s final gasp of light.